Law students, talking about school, life, politics....whatever we want! And yes, we're 2Ls now. You know you're tired when Garfield's Scary Scavenger Hunt becomes too difficult to figure out. Let me know if you find the red key. 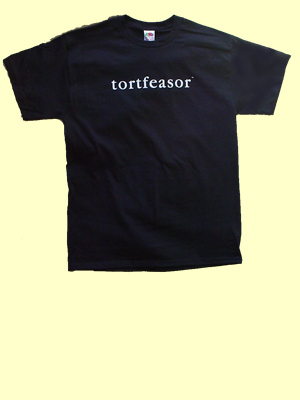 folks--grab a tortfeasor t-shirt at tortfeasor.com (all they do is sell shirts with "tortfeasor" on them), and be the coolest kid on the block. think of it as the law equivalent of an "i'm with stupid" shirt. or a way of fitting in in west philly, or any other crime-ridden law school environs you happen to be in. I love him and I hate him. He's Anonymous Laywer. Thanks to Evan for the introduction. Bacon Answers More Reader Mail from the Same Gunner Who Wrote Her Last Time! instead of attending the admitted students' thing? of what 1Ls have to go through, now that you're almost finished? and porkroll is right. enough about the collegial atmosphere. we get it. brownie caesar salads for everybody! 1. Law school has been good to me. Weren't expecting that, were you? Sure the people are ugly and the food is bad, but it's a small price to pay for complete freedom from responsibility. I read a little; I write a little. And I don't even have to do it every day. It's way better than working for a living, trust me. 2. I would never throw my head back and cackle. If I laugh at you, I laugh in your face. It's the polite thing to do. 3. And finally, collegiality is not communism. It's a social program that ensures nerds don't get left out of anything. And from what I saw of your 0L class, they best be signing up here. Pork n Beans has opened quite the door. Scathing, indeed, but painfully true. The only event more vital to my existence than breathing is the complete and final destruction of the Ticketmaster/Clear Channel strangle hold currently depriving the music industry of all fresh air. Those heinous illegitimate children of flea ridded desert animals dare to keep the talented, little man down while shamefully riding the dregs of the music industry (Spears, N Stink, etc.) all the way to the graves of their short-lived musical lives. All in the name of profit while true musical connoisseurs, such as myself, have to suffer...locked away in the backroom of a remote Siberian gulag and told to keep quiet under threat of brutal, Stalinesque type punishment. I hear Ticketbastard/Clear Channel singing "go profit, go mediocrity!" I sing, go home you defenders of oppression...it's time for choice, talent, and variety to grace our airwaves and music halls once again. so i'm listening to stern this morning, and have to admit, his whole ‘radio jihad’ against the current administration is beginning to get to me. i want the usual fare of strippers and fart jokes back. still, though, the king of all media does have a point. The current frenzy over nipplegate is pretty childish. to all the people screaming about protecting innocent virgin ears from prurient content, I say: turn off the radio. don’t let your kid listen to it. just because i object to creationism, it doesn’t mean i’m going to work for the government to ban religious schools—I only ask the same tolerance I offer. in all seriousness, the FCC’s application of its own policies is about as consistent as the Feds’ story on WMD. what’s indecent? oprah can discuss tossing salad, but stern can’t repeat her discussion? Let’s have some consistent precedents here. there's a petition making the rounds to ask Congress and the FCC to craft a more coherent standard for determining 'indecency' – I’d urge folks to sign it. with a clear standard, we'll have lower enforcement costs, higher certainty for business, and higher accountability for broadcasters. what's particularly upsetting is that the GOP is so actively pursuing this alleged ‘threat to decency’. i’m all for compassion, but let’s stay focused on the more important goal of limited government, and keeping uncle sam out of my life and wallet. The administration has lost its way—its authoritarian social/moral agenda is a bigger threat than any economic authoritarianism. And another thing. Dubya claims he didn't even watch the whole superbowl--instead, he went to bed before halftime. I’m not sure I like the idea of a president that doesn’t watch the superbowl—it sounds kind of, oh, I don’t know, un-American. Right. Make that "coherent" and "Wisconsin." Please direct any and all future spelling corrections to bangersmash@sounditoutinsteadyoulazyfool.com. The need for me to post this weekend has been obviated (yes, Professor Wax, I know what that means!) by our new bloggers, who have been blogging up a storm. Welcome to "Bangers and Mash" and "Pork n Beans." I trust their posts will have the same snarky flavor that our readers have grown to love. As a sidenote, I assume the spelling errors in Bangers and Mash's recent homage to Governor Dean are there as a protest, because he believes that spell checkers are part of Big Brother's effort to pound us into anodyne conformity. Later that afternoon, Bacon and I went shopping. For those of you who live in the city of brotherly love or are considering it, I suggest you experience the Gallery at Market Square, at least once (actually, you'll probably go there only once.) This large, indoor mall is pretty frightening in many respects, but they do sell Lacoste shirts at Strawbridge's. The Gallery also has within its walls one of the greatest fast food restaurants known to man: Popeye's. Bacon and I lovingly ate our biscuits, followed by gelato at the excellent gelateria on 13th and Chestnut. Following our 4000 calorie excursion, we papier machéd and watched Law and Order. I've always been a fan of Law and Order, but long believed Bacon ventured into hyperbole (shocking, I know) when describing its educative virtues. I was manifestly in error. Over the course of two Law and Order episodes, we saw ADA Alex have hearsay admitted (because the statement was against penal interest) and learned about Chief Judge Cardozo's opinions on foreseeability of harm, among other fascinating legal tidbits. I certainly learned more Friday night than I did during the Thursday morning Crim double header. All in all, I had a capital evening. Lest you 0Ls out there think that no one here does any work (although it is true that I do very little), I spent most of Saturday and much of today alone, trying to get work done. The upcoming week is going to be a busy one, and exams are quickly approaching. 1) Instead of "Your assignment for Monday is pp. 910-918...oh and finish the section on....," it would be "AND WE'RE GOING TO READ CONSPIRACY....AND WE'RE GOING TO READ MURDER....AND THEN WE'RE GOING TO READ ATTEMPT....AND WE'RE NOT GOING TO STOP UNTIL WE FINISH THE BOOK!!!!" Then class would be canceled for the rest of the year in mid-February due to no one reading, which is actually not too far from the truth. 2) An upstart associate professor who teaches an unpopular, backwater subject would apply for the job of Dean and actually think he deserved it (oh and note I use "he" unlike our politically correct casebooks). 3) Penn Law would use excess volume and radical phrases instead of coherant ideology as its basis for curriculum. 4) Penn Law would declare itself the greatest law school in history, claim to be the right law school for you and the rest of the country...then close its doors because no one from Wisconson came here and endorse Harvard shortly thereafter as the greatest law school in history, hoping to become the vice-greatest law school in history. Well, ok. Bacon, you are still going down...wiry or not...look out!!!! According to Bacon, I am a lazy libertarian drunk. This is true. I cannot refute this. True to form, with the booze still in my system from Friday night, I am ending this, my first post, right here due to general lethargy and in protest over the blog's big government behavior of late. Damn the man. PS: I have now opened a betting house. Anyone interested in making a wager regarding (a) our class schedule in Con for the rest of the year; (b) how many more times Professor Katz will run into the computer in class, or (c) how many additional off-color racial references will be made in Con, please go to the basement of Sansom Place East to the janitor's closet and ask for Daryl. Cash only. Professor Madison is our faculty sponsor. so, we've just been informed of some details on the uber-prestigious journal writing competition, and i've gotta tell you, i can't wait. not only do they hit us up directly after exams, when our brain cells are at their most refreshed, but we have the pleasure of spending 3 days locked up in the library doing glorified spell-checking. then, we have the pleasure of spending the next 7 (count 'em!) writing an essay on a yet-to-be-disclosed topic. i can just envision the literary masterpieces we'll create (think so many monkeys at so many typewriters). but i'll show them. for the essay competition, they let us back out into the world--we can even leave town! i'm thinking i can combine my nifty wireless access with a much-needed beach vacation. nothing like the mai-tai muse to get the words flowing. speaking of which, i've had it with con law. time to hit the bar. i'm a penn law admitted student (0L?). your blog seems pretty cynical/jaded/snarky. would you say you're more c/j/s than the average penn law student? and why'd you add "bangers and mash"? i'm suspicious of new people. me and notes from the 1L underground had a good thing going. anyway, i like reading your blog, keep it up. 1. I am not cynical, jaded, or snarky. Especially not snarky. The New Yorker is snarky. I'm more of an US Weekly or a Ranger Rick. 2. Bangers & Mash was added for diversity. We needed more representation from the Penn Law population of lazy Libertarian drunks who don't post to the blog when they say they will. Please feel free to ask more questions; I don't go to class anymore so I have lots of free time. Recently I have been characterized as "Burnt-out and Bitter," "The Duchess of Snotty Face Manor," and "Unwilling to Live in Brooklyn." I'm not sure how this makes me any different from my classmates. I'm sitting here with a bag of candy (watermelon pieces) and nothing to drink for either one of us. They had no diet beverages, and no water. A classmate was looking for pretzels. She, too, went home hungry. How does this happen? This is far from the first time that the cafeteria has run out of diet beverages and water while simultaneously stocked full of regular Pepsi. Has it never occurred to the powers that be at Stern that they should order fewer regular beverages and more diet soft drinks? Lesson 5,938 in the evils of monopoly. Incidentally, the people who run dining services here at Penn are constantly threatening to shut the dining hall down because of underuse. Maybe sales would be higher if they sold the items that people were wanted to buy. Like diet beverages. And sandwiches that are either reasonably priced or edible (one of the two would be an improvement from the status quo). Just a thought. I think 2L Library Enemy is sitting behind me in the library. If I had a stick, I would totally poke her. I love Clyde Summers, Labor Law legend and Man of the People. Some people think he's a communist. Some people think he's a million years old. I think he's just swell. Sure it's hard to tell if he's asking you a question or just yelling about something, but who cares? He's managed to push the Worker's agenda on Penn's population of grumpy Libertarians and Wharton rejects for 60 years. I want to adopt him. We're supposed to have lunch next Friday at the Faculty Club -- a "Fun Food Friday!" according the menu. I will have the baked ziti (a fun food) and admire him. Check out this post, which is a link to a story that was originally published in the Georgetown Lampoon. Does this remind any of you of undergrad? All those who vote aye, wear a pastel Lacoste shirt tomorrow. We love comments and emails; this whole project is much more fun when you talk back. Your bloggers talk to each other (too much, in fact: during class over Instant Messenger, and in the quiet zones of the library so frequently that we get "sushed" by our overly uptight fellow classmates), but we want to hear from you. So, comment away, please. I promise that our responses will be less snarky than our posts. There was only one problem, which started out small, but ended up to be such a major annoyance that it is unlikely I will order such a creature again. The crepe was wrapped around the interior of the cup. First I tried stabbing at it with my spoon – entirely useless. Then I went and got a knife and fork to try to eat the crepe, but they little profited me. At this point, I was swimming in a moat of plasticware and rapidly melting ice cream. It took me half an hour to eat half a crepe before I was entirely enervated and threw the cup into the trash. In the future, if I want an ice cream sundae in an inedible container, I’ll order one from an ice cream store, and if I want a dessert crepe, I’ll get some nutella monstrosity. I made the mistake of picking up the Real Estate section of the New York Times this morning. It appears that I will never own a home. Any space in the tri-state area large enough for a hotplate and an army cot is priced at about a million dollars. Conventional wisdom regarding the earning capacity of attorneys notwithstanding, how will I ever find a million dollars? An awful lot of people will need to slip and fall . . . down wells . . . on corporate-owned malciously boobytrapped property for me to even make a down payment. What to do? Bacon and I attended another law firm reception tonight at Pod. The duck rolls were particularly good, and I didn't have to talk to a single bloviating hiring partner. Excellent! The rest of the evening was, however, rather bizarre. I'm in the middle of a longer post which will be finished tomorrow (maybe during Con Law. I hope Persily doesn't call on me, since we're "all on call."....oooh! I'm scared! :)). Goodnight! Miffed at the universal solitaire playing and web browsing that goes on in class, our Con Law professor sent out an email notifying our section that we will ALL be on call tomorrow and to "BE PREPARED" . . . something . . . something . . . like the Boy Scouts do. So naturally I turn to the person next to me and begin to complain -- the standard "I can't believe he's doing this" followed by an "It's ridiculous." And because god likes a good laugh, our professor walks by just as I do. He smiles at me, raises an eyebrow and says, "Ridiculous?" I nod. He smiles again. I'm doomed. So now I'm in the library doing my Con Law reading. Word on the street is this blog has been discovered by Penn's prospective 1L's. I'm just waiting for the Dean to shut us down. Both Bacon and I are still deep in the midst of our 1L summer job search. Think deep like a well. A never-ending, hollow, empty well entirely devoid of content. Not even a drop of water. And we're both parched! Is it really supposed to be this hard? Anyway, we both applied to work for the same Legal Aid foundation (to remain nameless, at least for the time being) more than a month before the deadline "to receive full consideration." That deadline was more than two weeks ago, so I decided to call this organization to check on the status of my (and by logical extension, our) application(s). When I told Bacon I was about to call, she ominously wished me good luck. I asked her why, and she whispered (we had already been castigated, after all, for talking...didn't we know it was the library? Now I know what they teach in the next two years!) something about the phones. You see, she had already experienced the Potemkin phone system, designed to make it look like this organization actually employs people, when in reality every employee of this inestimable organization must have fallen down the hole I spoke of earlier. I returned to the library to do some reading (getting a position for this summer is not a full-time job after all, although it certainly feels like one). I tried again at 4:45. This time I kept hitting zero whenever I got a voicemail box; I spoke to the same (human) operator three times. On the fourth try, Eureka, I found a person. The HR person. I was so startled to hear a human voice that I was momentarily speechless. Recovering my composure, I asked her about the status of the summer internship applications. "All filled" was her meager reply. "We received tons of applications this year," she helpfully yet mockingly noted, failing to supply the corollary, which is that they found mine (and Bacon's) less than impressive. I asked (in a friendly way) whether they planned on contacting those who applied to let them know that they did not stand a chance of working with their organization. "Oh," she replied, "even though these people have agreed to take the jobs we've offered them, many will disappear if they find something that pays better. We don't pay that much, you know." Yes, I know. Actually, you don't pay anything. But attention to detail obviously isn't prized by your organization; no wonder Bacon and I are unqualified. "We're keeping your applications around in case someone fails to show up; then we may give you a call." Gee thanks. Couldn't you just tell us this without my having to fight tooth and nail for the information? It's not that hard to send out a blanket email. Maybe they're worried that the rejected will reply/call/ask questions. They could just do to these inquisitive souls what their organization seems to do best -- ignore them. I hope Legal Aid doesn't treat their clients like this. Bacon says we haven't been rejected, only waitlisted. I prefer to think of our applications as traveling down a deep, dark hole, never to be seen or heard from again. Earlier this month I decided I would attempt to make the law school experience more exciting for everyone with the introduction of costumes! Thursdays will be Goth Thursdays from now on. In preparation, I shopped today for that traditional cornerstone of goth girl style, the corset. I was looking for one online during class, and just as my neighbor looked over, I happened upon the Vampire Chunky Naked Ladies in Corsets site. So now she thinks I'm some sort of chubby vampire pervert. Lovely. This is what you get for trying to make law school more fun. Bonus: A letter . . .
We met this afternoon in the course of your attempts to shush me. It might have seemed that I was ignoring your efforts as I laughed with the Porkroll. Well, I was. But I didn't ignore you. I laughed at you and your scary tight ponytail for a really long time. Like the Pork Roll I too have a large, dark, empty space where my summer employment plans should be. But then again, I only sent out two resumes. Still . . .
You would think Legal Aid would need a little extra help with the pushcart redemption with NO ONE WANTING TO WORK THERE FOR FREE AFTER GRADUATING and all, but I've heard nary a peep from them. You would think they would reject candidates on a rolling basis. I like my rejections timely. Shady Personal Injury Firm doesn't begin the hiring process until April. This makes sense in that summer for the rest of the world begins in June, however, this helps me not at all seeing as Penn wants us out by the end of April. This is what Law School has reduced me to -- I am now desperately trying to GIVE my summer vacation away. Sheesh. It's amazing how hard it is to come up with something worthwhile to say once you lose the rhythm of posting on a regular basis. Last week was Spring Break, and all three of your humble bloggers left the city of brotherly love for greener pastures, although only one of us took a real trip (that is, one to a place that was a) warm and 2) not our parents' home). Anyway, I'm becoming increasingly stressed that I have yet to secure summer employment. One would think that someone would want me to do something (for free, I might add), but no dice, at least as of yet. I'm going to be spending the summer with my aunt and uncle in Pasadena, CA. If anyone has any suggestions, I'd appreciate them immensely. I'm blegging you! Just got off the train from New York. Today I share with you the Train Conductor's wisdom: "No tickets in the mouth. No money in the mouth. I won't take ticket that've been in your mouth because that's how I get colds. And if I get a cold, no one goes to work. And I don't go to work there's no trains. And you don't get to go anywhere. No work; no trains -- all because somebody was licking tickets." I'm headed up to New York later this afternoon. I have a meeting on Thursday with the super shady personal injury firm I'm trying to get a summer job with. Wish me luck. Though I'm sure I'd be good at putting neck braces on clients and creating small yet significant hazards in department stores or whatever they'll have me doing. Really, at this point, I'd sell hotdogs from a cart if I could put it on my resume as summer legal work. With Con law cancelled for the week, I am adrift. I was planning on joining Pork Roll for class this afternoon, but I got sidetracked. On my way to the lunch cart, I met up with people headed to the Olive Garden. THE OLIVE GARDEN. I think the last time I went to the Olive Garden I was on one of those fancy dates in high school. The kind where you put on your lacy training bra and your date wears Drakkar. Really, how could I not walk the twelve miles across town to eat there? So I find myself sitting in a small discussion class today bored out of my mind. What's worse, not one of the people who normally makes class bearable is here today. One overworked herself, and is probably sleeping in her incredibly comfortable bed. The other two, however, are more than likely outside frolicking in the excellent weather. Jealous am I. Today's reading is politically charged, and I'm just waiting for the fireworks to fly. My favorite line was when Chalmers Johnson called something "practically classified." Actually Chalmers -- the document about which you speak is un-classified; using a technical term in such a way is did is an abuse of language, although unsurprising -- I found this piece too politically and emotionally charged to be entirely believable. I found so much animus (particularly towards the United States) that the I think the piece is simply too tendentious to be entirely reliable, although I do not doubt that the problem of which the author speaks is real and must be dealt with. Half as much heat, and I would have been far more convinced by Johnson's argument. On Friday this madness temporarily ends and Spring Break begins. I'm going to Puerto Rico to stay at the HoJo by the ocean and drink out of coconuts. I should probably be continuing my job search or outlining or catching up on reading, but why? LEGAL WRITING HOW YOU LIKE ME NOW? I'm finished with my hideous albatross of a brief, and now I'm free! Free! I beat Microsoft Word! It tried to break me with its poorly designed counterintuitive buttons and tables feature, but I prevailed. And I'm the one dishing out the punishment now. See if I order any enhancement packages. I'm free! Free! Free . . . to do my reading for Crim now. Damn you law school. You just never let me win.